In her book, On the Courthouse Lawn: Confronting the Legacy of Lynching in the Twenty-first Century (Beacon), Sherrilyn A. Ifill, a professor of law at the University of Maryland School of Law, dissects the history of lynching by narrowing in on instances of it in the Maryland area. The title of her book refers to the fact that, as opposed to solely taking place covertly, in hidden, wooded areas, lynching was often done right at the justice seat, in plain sight of law enforcement, in daylight. Such is the case in the above photo, which forms the cover of Dr. Ifill’s book. It’s from a postcard; memorabilia of a lynching was often traded, sold, or sent to friends and family. You can hear this thoughtful woman’s ideas by tuning in at 2 pm. If you’re outside of the New York tri-state, you can check out our stream on the web. If you miss the live show, check out our archive for up to two weeks after broadcast. 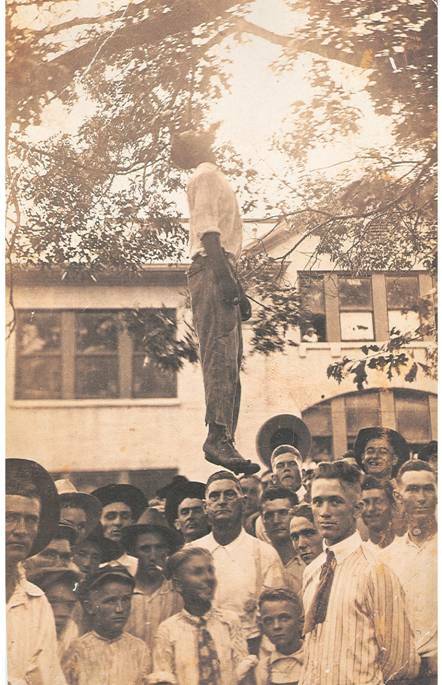 I hate lynching photos for obvious reasons, but increasingly I’ve been looking at the people in the pictures and the macabre looks on their faces. They say a lot about the animalistic nature of white supremacists. I am 46 years old and from California. I have had three friends lynched. One in the late 70s and two in the mid 80s. The kind of activity is not a “thing of the past.” Each one of cases was closed as a suicide. Another book on the subject is James Allen’s “Without Sanctuary: Lynching Photography in America”. I happened across it in Barnes & Noble. It’s powerful.